EC541A-II: For individual operation of a single blind. 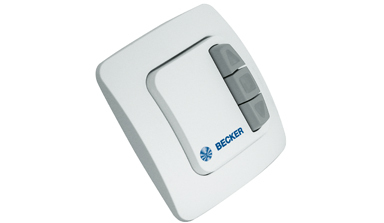 Can also operate multiple blinds as a group. 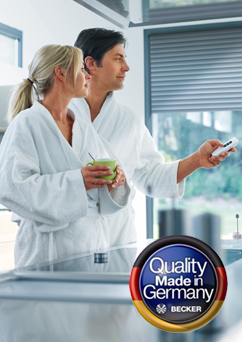 EC545A-II: For individual operation of up to five blinds. There is also a designated group channel for group operation of the five individual channels. There is a further group channel which allows operation of all ten individual blinds as a group. This remote is perfect when installing dual blinds on the one window (translucent and blockout). All translucent blinds can be programmed into channels 1 – 5 allowing individual control of these blinds as well as group operation. Further to this all blockout blinds can be programmed to channels 6 – 10 allowing individual control of these blinds as well as group operation through its sub group channel. When all blinds need to be lifted or lowered the master group channel (channels 1 – 10) can be utilized. EC311A: For individual operation of a single blind. 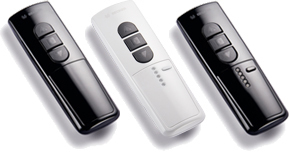 Can also operate multiple awnings as a group only. EC315A: For individual operation of up to five blinds. There is also a designated group channel for group operation of the five individual channels. 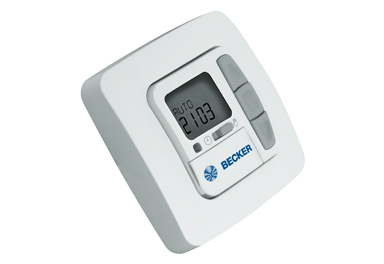 Becker offers timers that allow the consumer to pre-program one UP time & one DOWN time per day. Individual times can be set for each day of the week, times can be grouped into MON – FRI & SAT – SUN, or the same time for each day of the week can be programmed. This function can be activated so your blinds operate at the designated sunset & sunrise times. 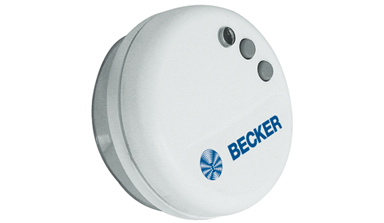 Becker offers a wireless sun sensor that will bring your blind down as the sun hits the window. This is ideal to protect furniture and floors from damage or fading due to the suns harsh rays. The sensor is mounted on the window and measures the sunlight as it hits your window. When the sun is measured over the level you require it, the sensor will bring the blind down. It will also raise the blind at the end of the day as the sun sets.